I'm a sucker for music festivals. There's something about spending the day (or the weekend) just listening to music. It's exciting to hear artist after artist, experiencing how they perform live. 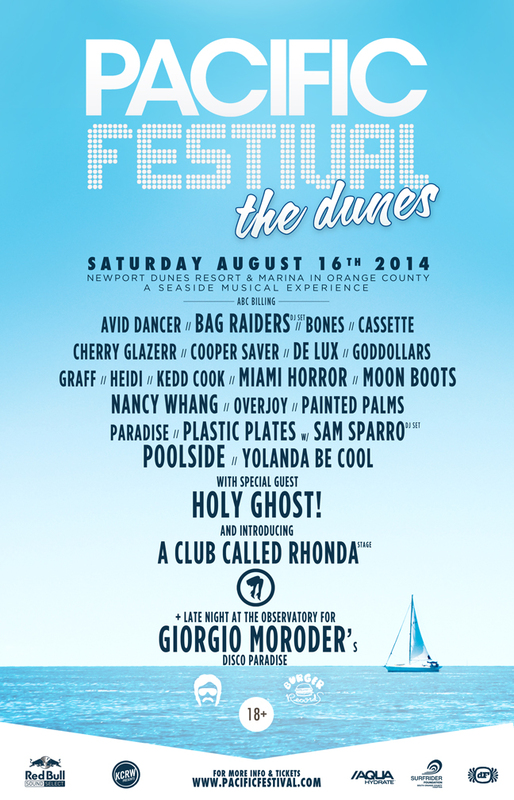 That said, I'm thrilled to head out to Pacific Festival at The Dunes* on Saturday August 16 in Newport Beach. My boyfriend & I are both cruising over, separately covering the events. Pacific Festival goes from 1-9 p.m., so it's not totally exhausting. Phew. I'm most excited to see Holy Ghost! & Miami Horror. Their music is fun, engaging, & gets your toes tapping to the beat. I can't wait to make the journey to Orange County, my old stomping grounds. The fest at The Dunes hosts 360º beachfront views along with waterfront stages & beach activities like lounge rafts & paddleboards. Say what? Time to relax to the max. I doubt I'll get around to paddleboarding, but the fact that it's an option is awesome. Plus, there will be live art & local foods. I'm always down to support local businesses & artists. I usually get mad munchies at music festivals due all the dancing, walking, & movement. Pacific Fest is an 18 & over event, which I am very happy about. There will be no hoodlum 14 year olds running or people with their kids. #ThankYeezus. Apparently, guests who are 21+ may enjoy their alcoholic beverages freely throughout the venue. That's normally unheard of because you're restricted to a beer garden area. How exciting. The countdown begins. I'm glad it's less than 2 weeks away because it gives me something fun to look forward to. I yearn for the sun on my skin & the water lapping against my ankles. Perhaps I can do an outfit post on what to wear to a beach front music festival...hmmm. I'm giving myself ideas. Haha. Anyway, it doesn't hurt that I get to spend the day with the one that I love. Miami Horror puts on SUCH a good show. You are going to have a blast! Oh yes! It seems like great fun!